One of my roles in my work is working with students to plan and facilitate spring break service trips. For my summer professional development, I spent a week in June in Atlanta at the Alternative Break Citizenship School (ABCs). The ABCs are sponsored by Break Away, the national alternative breaks organization. I got to spend the week with 16 other faculty and staff from around the country, learning, sharing ideas, and serving at local agencies. We worked at both Healthy Belvedere and Atwood Community Gardens on community driven projects including digging a walking track and working on community garden projects. During the week, the Break Away staff did a great job feeding the 60+ participants. The staff prepared breakfast and lunch and we ate as a group. For dinner, we ate from local eateries, including some of the best pizza I’ve ever had (I wish I could remember where it was from for the next time I go to ATL!). Twice, we enjoyed so delicious food from local food trucks. 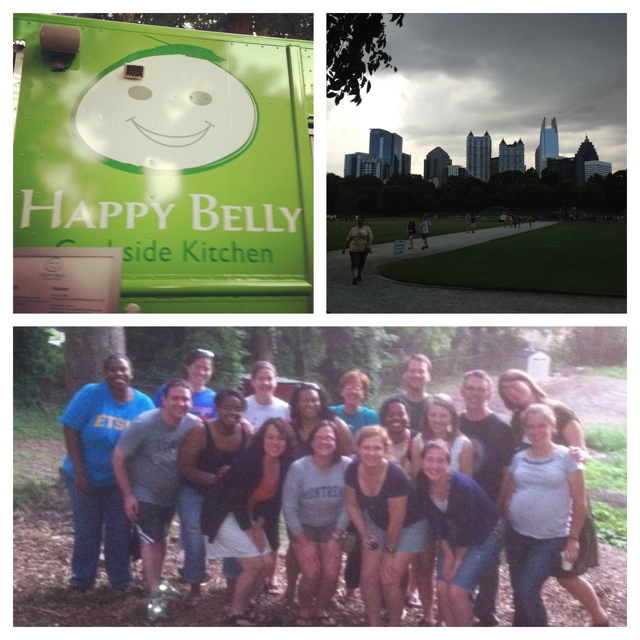 On social night, we went to walk the Atlanta Beltline and ended up at Piedmont Park (in the picture above). We ate at The Good Food Truck. I had the mini Parmesan waffle cone filled with watermelon-arugula salad and the Georgia Plate which includes collards, black-eyed peas, and pimento cheese grits. On Community Dinner night, we went to one of our agency partners, Atwood Community Gardens, and enjoyed a delicious dinner from Happy Belly Curbside Kitchen in the company of community members and folks we had served with throughout the week. I had the Happy Hippie: a grilled portobello mushroom, roasted red pepper, gouda cheese, and dressed arugula on a kaiser roll. I also had some of the best fries I’ve ever tasted. Overall, it was a great week of hard work, learning, time with new friends, and good, local food. I can’t wait to look up these food trucks next time I’m in ATL!